Not every game we review is a standard online slot machine and Cashdrop is a good example; it was developed by Orbis Games and vsGaming and doesn’t particularly resemble anything we’ve played before. 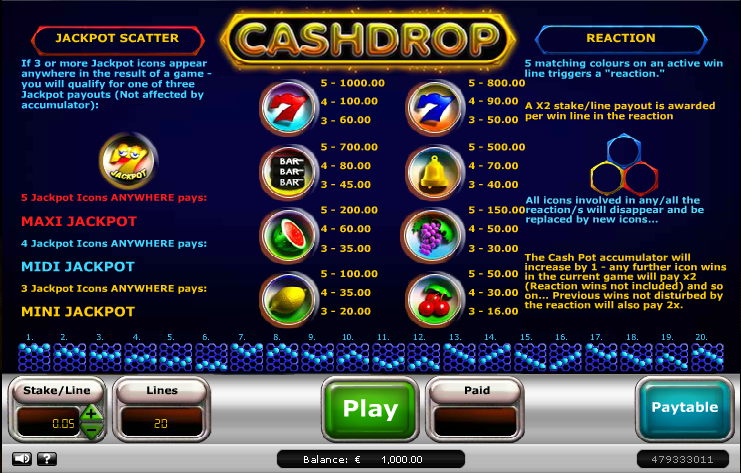 Cashdrop does lay some claim to being an online slot machine – there are five reels and twenty paylines and the symbols are recognisable as belonging to the genre but we would argue that that’s pretty much where the similarities end. 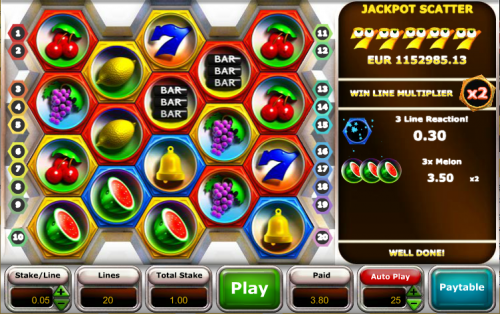 The symbols are beautifully rendered and we have cherries, lemons, grapes, melons, bells, Bar symbols, blue sevens, red sevens and a jackpot symbol. The background of each is also coloured red, green or blue. You can check out the video below for an example of gameplay but as a quick explanation, the reels are to the left side of the screen while on the right you will see a box which records all your wins. You can now click ‘Play’ or press ‘Autoplay‘ and the symbols will all start to revolve, spinning until they come to halt at which point winning combos will be resolved and listed on the right hand side. Standard payline wins are paid to the player in the normal fashion but there’s also a secondary way to win which adds a bit of creativity to the proceedings. This is called a ‘Reaction’ and what will happen is if all the background colours on a winning payline match, those symbols will disappear, allowing five new symbols to fall into place. Each time a reaction is formed during a spin, the multiplier will increase by 1, so two reactions will mean a multiplier of 2x and so on. Three jackpots are available and these are triggered by landing three, four or five jackpot symbols which will reward the player with the Mini, Midi and Maxi prizes. These are variable and the potential wins can be seen in the top right hand corner of the game screen. Cashdrop is one of those games which it’s almost a pleasure to watch; the symbols spin in a very satisfying way and the extra ‘reaction’ feature adds some inventiveness to the proceedings. The paylines are fixed so the minimum stake is a modest €1.00 up to a maximum of €200.00.